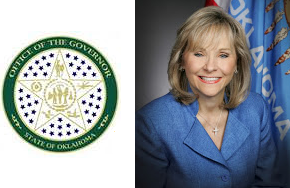 OKLAHOMA CITY – Governor Mary Fallin today delivered the annual State of the State Address in front of a joint session of the Oklahoma Legislature. In it, Fallin focused on the urgent need to improve the state’s budgeting process, saying the Step Up Oklahoma plan proposed by a group of community and business leaders is the best option for lawmakers to sufficiently fund education, public safety, health, and the state’s infrastructure needs. Her State of the State Address can be found here. The proposed Executive Budget for Fiscal Year 2019 can be found here. Fallin, in her final State of the State address, opted not to talk about her accomplishments during her seven years in office. Instead, she urged lawmakers to focus on solving the state’s budget crisis and address important policy goals. “Make no mistake about it: This is an historic, defining moment before us. We are in a unique period as this legislative session begins with a concurrent special session. We also are at a special point in Oklahoma’s journey because the prospect of a brighter path forward is so very near. The governor said lawmakers should also consider reforms proposed in the Step Up Oklahoma plan, saying revenue alone will not stabilize the state’s budget situation. Fallin asked lawmakers to invest in ways to be smarter on crime, but yet remain tough on violent criminals. “Too few Oklahomans are getting the treatment they need for substance abuse and mental health issues, and are instead winding up in our criminal justice system. We need to stop warehousing moms and dads, sons and daughters in prison when many just need substance abuse treatment. Fallin, for the third year in a row, challenged lawmakers to approve a pay raise for public school teachers. The Step Up Oklahoma plan includes a $5,000 pay raise for teachers. Fallin said teachers will see the increase not just as a way to help pay bills, but as a validation of their vital vocation. The governor, during her speech, reminded lawmakers of the policy strides taken by the Department of Human Services in the Pinnacle Plan to meet the needs of abused or abandoned children. Oklahoma has the highest number of gains in foster care homes in the nation. Fallin asked legislators to recall the Oklahoma Standard – of neighbor helping neighbor - and of the state being Oklahoma Strong – when in the face of crisis Oklahomans came together and solved the problem. “The people of Oklahoma expect excellence and demand we solve our state’s problems. That is why we were elected – to lead, roll up our sleeves, get to work, solve problems, and find solutions.